Rutamina is a Spanish language website for creating routes and travel itineraries. 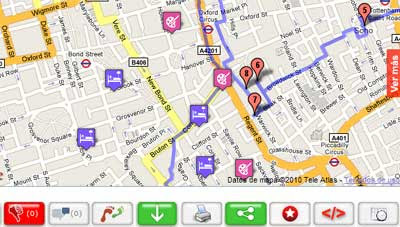 Users of the site can create their own routes using Google Maps or browse the routes created by others. Routes are displayed on a Google Map with points of interest shown along the route using numbered map markers. Descriptions of the points of interest are given below the map. Each point of interest on the route also includes its own Google Map. Nearby Street Views of the route and photographs are also provided. It is also possible to select from a number of layers to view additional information on the map, such as hotels, museums, bars and restaurants. The site includes integration with Facebook and an option to rate individual routes.